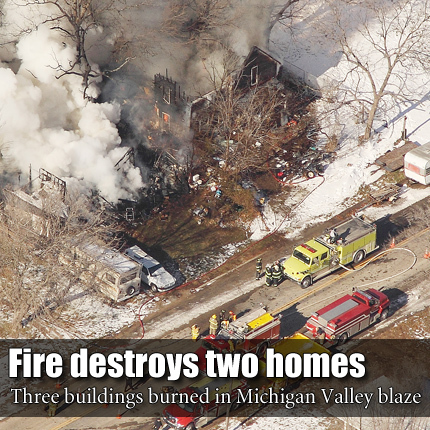 An aerial view of the fire that burned two homes and a trailer in Michigan Valley Dec. 21. MICHIGAN VALLEY—Fire broke out in a residence at 213th and Michigan Road Friday, Dec. 21, and quickly spread to a second home before fire crews were able to extinguish it. Osage County Fire District No. 4 Overbrook received the call at 10:21 a.m. and the fire crew stationed at Michigan Valley was the first to respond. Overbrook Fire Chief Donovan Thornton said the cause of the fire is still under investigation. The two residences burned completely to the ground as well as a trailer behind the first house. The properties were owned by Charles and Thelma Brown. The Browns were living in the residence that caught fire first, but were out of town during the fire. The second residence was vacant.